Six million children under the age of 18 attend California public schools — they deserve a governor who shows up and fights daily to give the best education possible to meet their full potential. Most of all, they need a governor who believes in the possible and models the impact of education; one who believes in the dreams and demands of every child, every family, and every community. We need a governor who prioritizes public education. A governor who commits time and energy to ensuring that our system is meeting the needs of kids and families in every community statewide. A governor who seeks to collaborate with the various stakeholders involved in public education, from educators and community organizations, to labor and faith leaders, to elected officials and charter advocates. The next governor will inherit the largest network of public schools in the country, which serve some of the highest-need students in some of the worst-performing schools nationally. As of 2017, there were reports that only 29.2 percent of fourth-graders in the state were proficient in math, and only 27.8 percent were proficient in reading. Those were each the third lowest share of any state nationwide. We have work to do. We have seen significant progress over the past decades in many school districts throughout the state, including Los Angeles Unified, which I have the privilege to serve as an elected member on the school board. We are proud of the work but not satisfied with the pace of progress. We need a governor who will fight for outcomes and commit to collaboration to ensure every child is given the best education possible to meet their full potential. We owe it to our kids and families to push relentlessly for progress; our educators need a governor who is committed to investing and supporting them with the resources they need and students deserve. Of the candidates vying to be our state’s next governor, Antonio Villaraigosa is the strongest candidate for public education. As mayor of Los Angeles, he was committed to rectifying inequality in education and closing the achievement gap. In 2004, before he was mayor, only 48 percent of Black and Latino students in Los Angeles who began the ninth grade completed grade 12 four years later. In 2014, one year after Villaraigosa left office, the four-year high school graduation rate was 76 percent for Latino students and 71 percent for Black students. Overall, when he began as mayor, 44 percent of students earned a high school diploma; by 2012, nearing the end of his term, graduation rates had soared to 72 percent. The work he began is surely partly responsible for the continued rise in graduation rates, which were 80 percent in 2017. There are a lot of stakeholders involved in public education, and a lot of interests vying for their own priorities. We need a governor who understands that prioritizing public education requires collaboration — our kids, especially those in underserved communities, deserve a governor who puts them first. I trust that Villaraigosa, should he be elected governor, will work to ensure that voices are heard, that groups and advocates are engaged, that parents are empowered. It concerns me that Lt. Gov. Gavin Newsom, the current front-runner, didn’t attend last week’s gubernatorial forum on education, equity, and juvenile justice in Los Angeles. This conversation focused on our children-related matters in Los Angeles, California, and the country. California is 46th in the nation in per-pupil spending and yet the state is the fifth largest economy in the world. We need a governor willing to serve our children and families with love, leadership, and courage. Antonio has lived the opportunities created by an education and a belief system in what is possible. 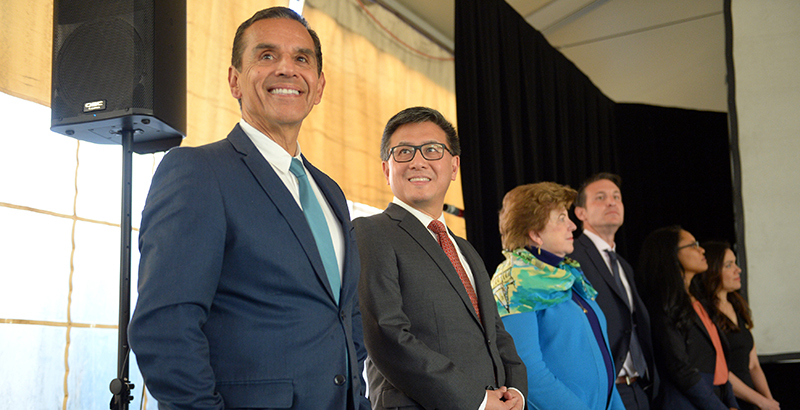 Antonio Villaraigosa fought for access and quality education for over five decades. We need Antonio to fight for our children as governor now. On behalf of the children I represent, the class of 2018 and the class of 2030, I am voting for Antonio Villaraigosa for governor. Mónica García is president of the Los Angeles Unified School Board.